The Clue Mysteries board game is the beefed up version of the classic Clue board game. In the original Clue, it might have seemed like you were only playing a murder mystery game at a party, what with all the random guessing and all. With Clue Mysteries, you’ll feel more like an actual detective when it comes to determining “Whodunit”. 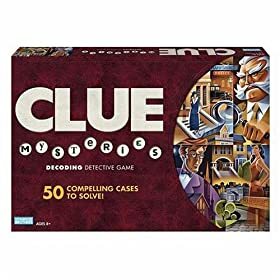 After a lengthy setup in which game pieces are placed, detective notebooks are passed out and the case to be solved is chosen, you’re ready to play Clue Mysteries. Everyone’s pawn has headquarters in Town Square, and movement is determined by a single roll of the die. To question a witness, you pick up their corresponding decoder folder and use the Spyglass to decipher their (true or false) hint (it’s a good idea to hit up Inspector Brown early on, as he will inform you of who is the Pinocchio among your witnesses). You then mark what the witness said (without showing the other inspectors) on your individual detective sheet. Your turn is now over. Other spaces you could land on throughout your travels include Open Road spaces, Vehicle spaces and Scene spaces. With Open Road spaces, you pick up a CLUE card as a souvenir and follow its instructions (it might redirect you to another space, for example). As for Vehicle spots, these babies act as the convertible that will take you anywhere your heart desires (on the board that is, not in life). Scene spaces will block a player’s path until they determine which location the criminal is hiding (Parade, Fair, Cart, or Bus) from Mr. Boddy. Want to play CLUE on your computer? with a 30-day trial to GamePass! These restless pogs will shift regularly during the game, cutting some opponents off from a shorter route and/or increasing the time it takes for a potential winner to make an accusation if they’re far away. You win by reaching the correct heathen hiding spot and successfully declaring who did it. You then open the casebook and first read to yourself if your detective work added up. If it does, read the solution aloud to all players. If not, sit back and let the other players finish. Clue Mysteries is definitely more interesting than the more average version of Clue. It has an astonishing fifty cases to crack, so if you like it, you won’t have beaten the whole thing after just a few games. Clue Mysteries takes awhile to set up each time you play and might lose its magic after a few plays for adults. The Clue Mysteries board game is an okay family game to keep around and occasionally pull out to entertain the kids. It has less emphasis on murder than in the original game.